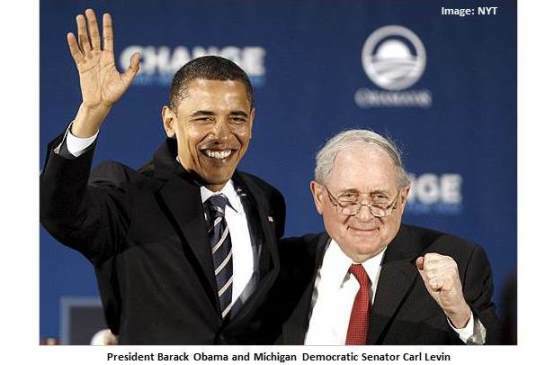 The IRS inspector general, who uncovered key parts of the IRS tea party targeting scandal, is coming under fire from a surprising source; Michigan’s retiring Democratic Senator Carl Levin. Levin, who chairs the Senate’s Permanent Subcommittee on Investigations, the Senate’s version of Rep. Darrell Issa’s House Committee on Oversight and Government Reform, on Friday released a 224-page report suggesting that the IRS improperly treated both liberal and conservative groups applying for tax exemptions while criticizing the May 2013 report from the Treasury Inspector General for Tax Administration for focusing only on the scrutiny given to tea party groups. This is interesting and important for a number of reasons. First, because new documents obtained by Judicial Watch reveal that 75% of the groups from whom the IRS inappropriately demanded donor lists were apparently conservative, with only 5% being liberal and the rest being not politically identifiable on their face. But even more importantly, because the IRS’ Washington, D.C. headquarters targeted conservative groups in part due to pressure from Senator Levin himself, according to emails obtained by Judicial Watch. Back in May, Judicial Watch released a batch of documents revealing that, contrary to claims by Lois Lerner and other top IRS officials, the handling of Tea Party applications was directed out of the agency’s Washington, DC, headquarters, rather than by a few “rogue employees” in Cincinnati. Back in May a lot of the media attention focused on the fact that the emails put to rest any doubt that Lerner’s initial explanations about how the IRS targeting of Tea Party organizations came about was a total lie. But now that Levin’s Subcommittee has jumped into the fray it is worth going back and looking at Levin’s involvement in setting the targeting in motion. The documents Judicial Watch obtained also include a chilling series of letters between Senator Levin (D-MI), Chairman of the Subcommittee on Investigations, and top IRS officials throughout 2012 discuss how to target conservative groups the senator claimed were “engaged in political activities.” In response to a March 30 Levin letter citing the “urgency of the issue,” then-Deputy Commissioner Steven Miller assures the senator that IRS regulations were flexible enough to allow IRS agents to “prepare individualized questions and requests” for select 501(c)(4) organizations – that is, conservative groups. The “urgency” was clearly the upcoming Obama re-election campaign. The IRS documents Judicial Watch released in May contain several letters and emails revealing an almost pathological obsession by Levin and IRS officials with determining what, if any, existing IRS policies could be used to revoke the nonprofit exemptions of active conservative groups and deny exemptions to new applicants. In a July 30, 2012, letter, Levin singles out 12 groups he wants investigated for “political activity.” Of the groups – which include the Club for Growth, Americans for Tax Reform, the 60 Plus Association, and the Susan B. Anthony List – only one, Priorities USA, is notably left-leaning. "There is no standard questionnaire used to obtain information about political activities. Although there is a template development letter that describes the general information on the case development process, the letter does not specify the information to be requested from any particular organization . . . Consequently, revenue agents prepare individualized questions and requests for documents relevant to the application. . ."